Trust My Garage is a badge of quality for Britain’s best local garages – every one different and every one dedicated to the highest standards of skill and personal service. Visit the TMG blog for expert car maintenance advice, tips on driving safely and finding a trusted garage, the latest road and vehicle legislation news, and much more. Have you seen us on TV? Watch our advert to find out why you should use one of our 2,900 garages nationwide. Why Choose a TMG Member? ​The Consumer Codes Approval Scheme, run by Chartered Trading Standards Institute, has approved the Trust My Garage code of practice. ​For expert advice on car maintenance, road safety, driving and more. Shield yourself from unexpected repair costs with our free and easy way to budget for car servicing and repairs. ​Watch our TV ad to find out why you should use one of our 2,900 TMG members nationwide. ​Find your garage to leave a review on your latest service, repair or MOT. 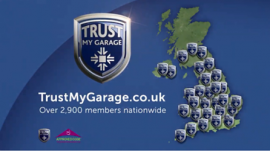 ​Trust My Garage is not a third party website that comes between you and your trusted local garage, it is a Code of Practice for independent garages. There are no extra costs for you or your garage which allows members to maintain their high quality and standards, and you will always be able to contact your garage directly so you can build a trusted relationship.